CloudLab supports reservations that allow you to request resources ahead of time. This can be useful for tutorials, classes, and to run larger experiments than are typically possible on a first-come, first-served basis. 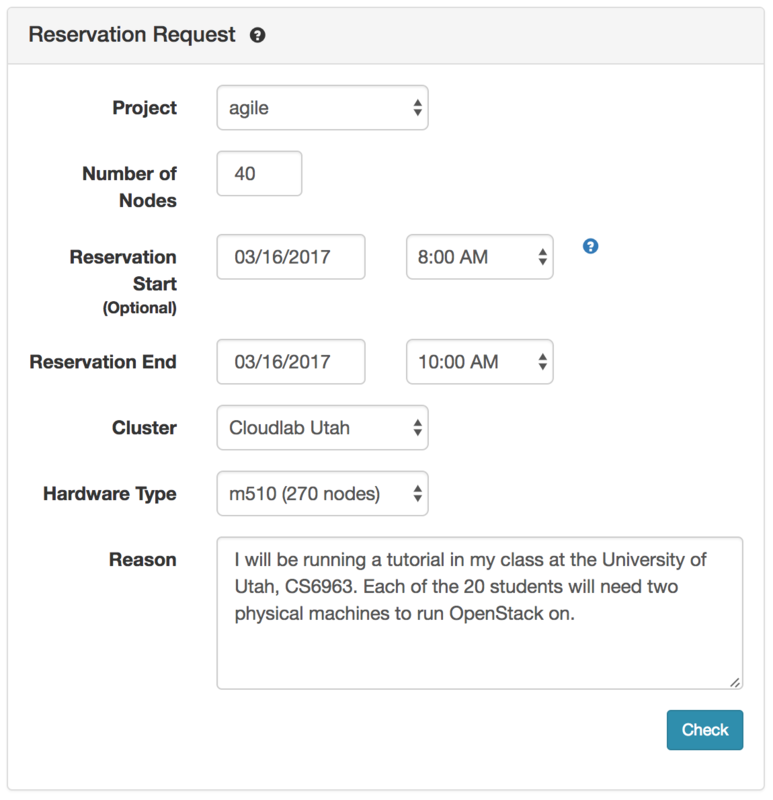 Reservations in CloudLab are per-cluster and per-type. They are tied to a project: any experiment belonging to that project may used the reserved nodes. Reservations are not tied to specific nodes; this gives CloudLab maximum flexibility to do late-binding of nodes to reservations, which makes them minimally intrusive on other users of the testbed. Having a reservation guarantees that, at minimum, the specified quantity of nodes of the specified type will be available for use by the project during the specified time window. Having a reservation does not automatically start an experiment at that time: it ensures that the specified number of nodes are available for use by any experiments that you or your fellow project members start. More than one experiment may use nodes from the reservation; for example, a tutorial in which 40 students each will run an experiment having a single node may be handled as a single 40-node reservation. You may also start and terminate multiple experiments in series over the course of the reservation: reserved nodes will not be returned to general use until your reservation ends. A reservation guarantees the minimum number of nodes that will be available; you may use more so long as they are not used by other experiments or reservations. Experiments run during a reservation do not automatically terminate at the end of the reservation; they simply become subject to the normal resource usage policies, and, for example, may become non-extendable due to other reservations that start after yours. Nodes can take several mintues to be freed and reloaded between experiments; this means that they may take a few minutes to be available at the beginning of your reservation, and if you terminate an experiment during your reservation, they may take a few minutes to be usable for your next experiment. The reservation system cannot account for factors outside of its control such as hardware failures; this many result in occasional failures to get the full number of nodes in exceptional circumstances. The reservation system ensures that enough nodes of the specified type are available, but does not consider other factors such as network topology, and so cannot guarantee that all possible experiments can be started, even if they fit within the number of nodes. Reservations held by others may affect your experiments in two ways: they may prevent you from creating new experiments or may prevent you from extending existing experiments. This “admission control system” is how we ensure that nodes are available for those that have them reserved. If there is an ongoing or upcoming reservation by another project, you may encounter an “admission control” failure when trying to create a new experiment. This means that, although there are enough nodes that are not currently allocated to a particular experiment, some or all of those nodes are required in order to fulfill a reservation. Note that the admission control system assumes that your experiment will last for the full default experiment duration when making this calcuation. For example, if the default experiment duration is 24 hours, and a large reservation will start in 10 hours, your experiment may fail to be created due to the admission control system. If the large reservation starts in 30 hours, you will be able to create the experiment, but you may not be able to extend it. Reservations can also prevent you from extending existing experiments, if that extension would cause too few nodes to be available to satisfy a reservation. A message will appear on the experiment’s status page warning you when this situation will occur in the near future, and the reservation request dialog will limit the length of reservation that you can request. If this happens, be sure to save all of your work, as the administrators cannot grant extensions that would interfere with reservations. To request a reservation, use the “Reserve Nodes” item from the “Actions” menu. After filling out the number of and type of nodes and the time, the check button checks to see if the reservation is possible. If your request is satisfiable, you will get a dialog box that lets you submit the request. If your request is not satisfiable, you will be given a chance to modify the request and “check” again. In this case, the time when there will not be enough nodes is shown, as will the number of nodes by which the request exceeds availalbe resources. To make your reservation fit, try asking for a different type of nodes, a smaller number, or a time further in the future. Not all reservation requests are automatically accepted. Your request will be shown as “pending” while it is being reviewed by the CloudLab administrators. Requesting the smaller numbers of nodes, or for shorter periods of time, will maximize the chances that youre request is accepted. Be sure to include meaningful text in the “Reason” field, as administrators will use this to determine whethr to grant your reservation. You may have more than one reservation at a time; if you need resources of more than one type, or on different clusters, you can get this by requesting mutliple reservations. To use a reservation, simply create experiments as normal. Experiments run during the duration of the reservation (even those begun before its start time) are automatically counted towards the reservation. Experiments run during reservations have expiration times as do normal experiments, so be sure to extend them if necessary. Since reservations are per-project, if you belong to more than one, make sure to create the experiment under the correct project. Experiments are not automatically terminated at the conclusion of a reservation (though it may not be possible to extend them due to other reservations). Remember to terminate your experiments when you are done with them, as you would do normally.